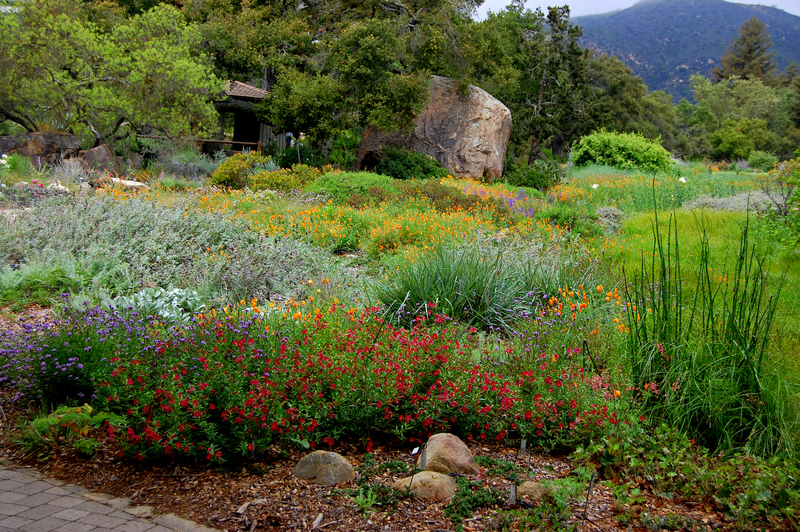 What makes a yard “drought-tolerant”? Despite the windfall of precipitation California has received so far this winter, it’s still a great idea to plan a garden that uses as little water as possible to thrive in the state’s dry summers and frequent droughts. A drought-tolerant yard or garden isn’t about simply reducing water use: it’s about creating a sustainable landscape appropriate for your climate. The first step in creating a “drought- tolerant” garden is to garden with plants that are appropriate to your regional climate. This helps create a thriving garden with minimal maintenance and extra water. Many beautiful low-water plants grow and thrive in dry climates – not just cacti! – and they can add color, interest, and variety to our gardens. Plants such as turfgrass and tropical plants often depend on more water than is naturally available in the dry, Mediterranean climate in much of California and the West, and are best replaced with drought-tolerant, non-invasive plants. Planting a mixture of native shrubs, grasses, and perennials will help you use less water, and create a landscape beneficial for local wildlife. But watch out for invasive plants that may be “drought-tolerant” but that can be garden bullies outside their natural range. Read more about the dangers of invasive plants – and find beautiful alternatives perfect for your climate – in our guide. Here’s the key to a sustainable, drought-friendly garden: Non-Invasive plants that thrive in your area will flourish with MUCH less water and work on your part! 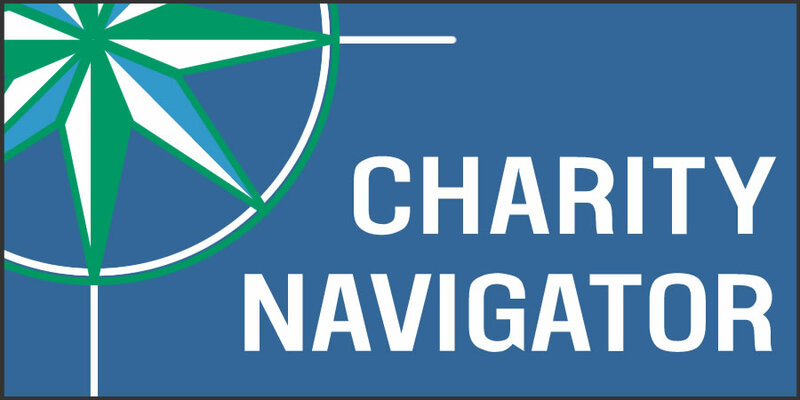 Please fill out your name and email address to access our free guide. How should I arrange my yard or garden for drought resistance? Every yard is different. Your yard has unique microclimates, slopes and hills, grass and plant history, soil makeup, as well as different amounts of sun, shade, and water that reach different areas. 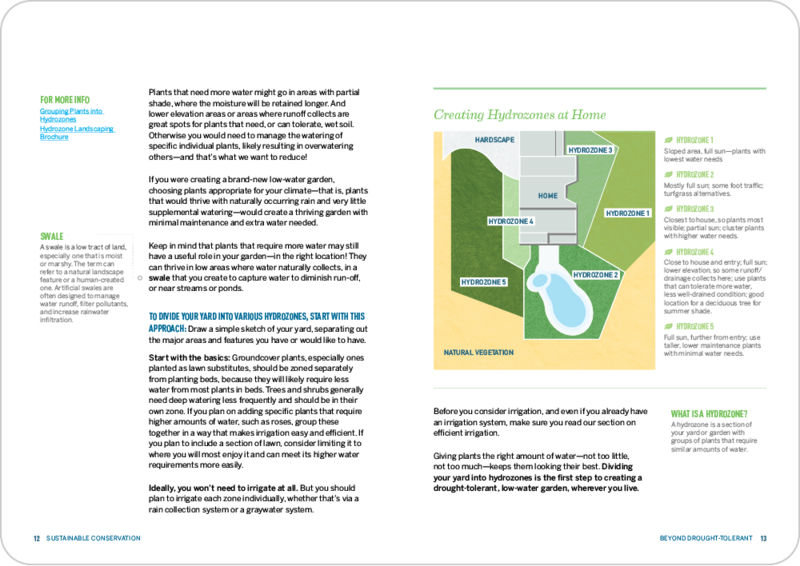 The first step to converting your yard into a low-water, friendly garden – especially if you’re working with a large area – will be to take advantage of those areas through what’s called hydrozoning. A hydrozone is a section of your lawn or garden with groups of plants that require similar amounts of water. As an example, lawns and turfgrass require different amounts of water from most plants in planting beds. Likewise, trees and shrubs generally need deep watering less frequently and should be in their own zone. If you plan on adding or keeping specific plants that require higher amounts of water, such as roses, hydrozoning is the practice of grouping these together in a way that makes irrigation easy and efficient. How should I use hydrozoning to arrange my yard? Start with the basics: Groundcover plants, especially ones planted as lawn substitutes, should be zoned separately from planting beds, because they will likely require less water from most plants in beds. Trees and shrubs generally need deep watering less frequently and should be in their own zone. If you plan on adding specific plants that require higher amounts of water, such as roses, group these together in a way that makes irrigation easy and efficient. If you plan to include a section of lawn, consider limiting it to where you will most enjoy it and can meet its higher water requirements more easily. Ideally, you won’t need to irrigate at all once your new plants are established (a few months to a year, depending on the plants and natural rainfall). But you should plan to irrigate each of your hydrozones individually, whether that’s via a rain collection system or a graywater system. Be sure to time your irrigation appropriately. Need more information on how to turn your yard into a low-water oasis? Download our guide to determine the plants you should use, and how to arrange and water them.